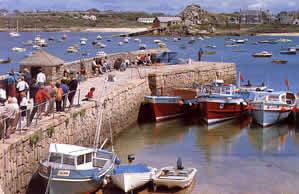 The Isles of Scilly or Scilly Isles are a group of about a hundred islands 28 miles south west of Land's End. The islands offer a timeless tranquillity with shining silver sands and sparkling blue waters warmed by the Gulf Stream. They are designated as an Area of Outstanding Natural Beauty, the coast is a Heritage Coast and the seas around a Marine Park. Five of the islands are inhabited. 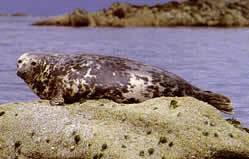 Most of the remainder are little more than sharp toothed rocks home to seals and seabirds. 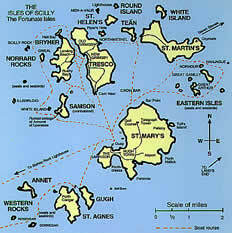 This is the largest island where the Scillonian and the helicopter and planes land. The capital is Hugh Town. Inter-island boats from the quay visit all the islands. 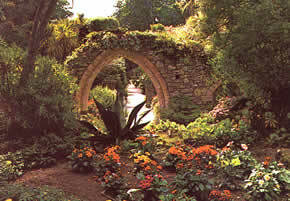 Famous for its spectacular gardens on the site of a 10th century abbey. There are displays of more than 5000 sub-tropical and exotic plants which do not grow happily anywhere else in Britain. 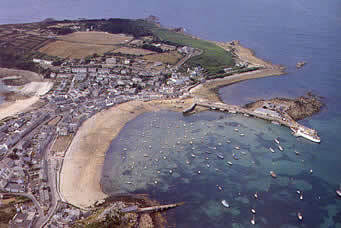 Surrounded by rocks and reefs and the resting place of countless wrecks with a small flower farming community. A narrow 2 mile long island rocky to the north and sloping to the south. Good sheltered sandy beaches. Rugged to the north west and peaceful bays full of wild flowers to the south. Many migratory birds to be seen in Autumn. The flower industry on Scilly began in 1868 when the first cut flowers were sent to Covent Garden market, London, packed in a hat box. This was successful and the flower industry grew rapidly with daffodils and narcissi flourishing in the mild winter climate giving the first spring flowers to markets. The picking season starts in October and goes through until April. This complements tourism so that the two industries exist side by side throughout the year.